One of the struggles of parenting is finding creative ways to get your kids to eat. Over the years, with three little ones, we’ve experienced a variety of mealtime situations, from a little one who barely ate anything to one who ate everything in sight! Here are a few things I’ve enjoyed doing to make mealtime a fun time for my kids from the first bites to 5 years old! I personally feel like the more options you expose your kids to, the better off they will be as they get older. This can include fruits, veggies, and everything else. With our oldest, we made sure he ate baby food for all of his early meals. Then, once we had our second child, we discovered how nice it was to have him eat what we were eating. Now, with our third baby, we’re trying to allow her the same opportunity so she can grow her palette and explore food in a fun way! So far she has LOVED everything! It makes me happy to know our kids get to try so many fun foods because I know I would get bored of the same meal day after day, so it makes sense that they would, too. It’s actually much easier when kids and grown ups can eat the same thing. I love to use bright colors with meal time. Whether you are using bright plates and cutlery or using food as the color (bright contrast in fruits and veggies are a great way to add some pops of fun to any meal! 3. Use Shapes to Make Food Fun! Who said mealtime has to be boring? Not us! We have a variety of fun shaped cookie cutters that work great for cheese, lunch meat, and sandwiches. A PB&J is a house favorite….but an elephant shaped PB&J, now that’s a treat! And what about puzzle shaped cheese? Table manners are important, but when else do you get to play with your food other than early childhood?! As long as my kids are eating, I love that they can have fun! 4. Bring Their Food to Life! Okay, I may need to practice a bit, but this attempt to make a bear out of bread, peanut butter, bananas, and food coloring is kinda cute, right?! And it puts a fun spin on a snack that our kids may have had over and over. And did you know that there are FOOD ACCESSORIES?! Yes, that’s right! 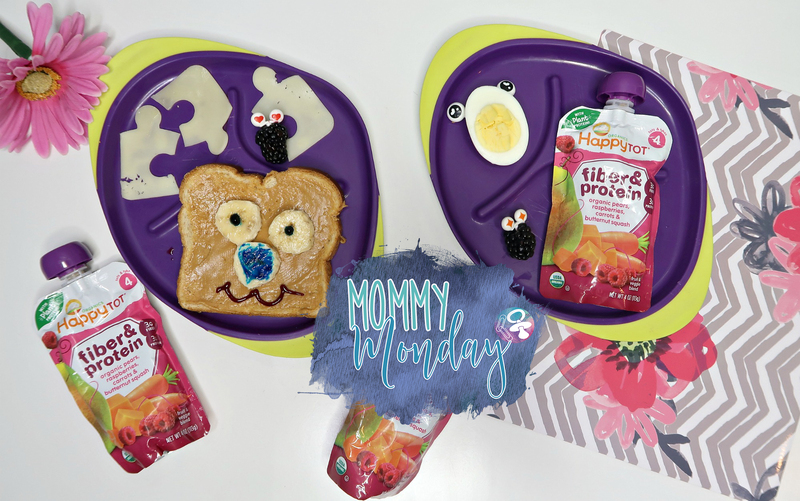 You can get plastic eyes to bring your kids food to life, wash, and reuse by turning ordinary fruit and veggies, or even a hard-boiled egg into fun little creatures. You know who loves cute little creatures? Kids! And if they love it, they just might eat it! 5. She’ll Have What He’s Having! There is nothing truer about young siblings than being able to guarantee that one will always want what the other has…. so why not feed everyone the same thing?! This even applies to mom and dad. You know how I get my kids to eat salad? I make a salad for myself. All of a sudden, my sweet little baby birds are ready for a bite! It’s really that easy! One of our new favorites is HappyBaby Baby’s First Whole Milk Yogurt……And did you know that Happy Family is the leading provider of premium organic foods for babies, toddlers, and children of all ages? That’s right! This means that no matter what stage my kids are at, from oldest to youngest, they can all enjoy something similar and made for their own age group! A romantic table setting may be what every mom wants (hint, hint to my husband if he ever reads this), but you can just as easily translate that setting into a kid version-a fun picnic anywhere that’s not the kitchen table…. Let them camp out somewhere they don’t normally eat (like mom and dad’s bed, a blanket in the park, or even a big round towel on the beach) and prepare a tray filled with goodies and decked out with happy toy flowers. Instant fun! When kids get to participate, it makes mealtime more special. For older kids, this can mean helping with setting the table, food prep, and even cooking a meal. What an amazing reward for their hard work when they get to eat something they actually made? My kids are so proud when they get to help! One of our favorites is homemade pizzas! Another great way to make mealtime special is to let them help each other. Andrew LOVES to help feed his baby sister and does such a great job with her. And she sure loves her big brothers so much, so not only does this allow her to eat, but it strengthens their bond and makes my mama heart melt! You can find Happy Family products available at certain grocery retailers. We found our yogurt in the refrigerated yogurt section. I love that the Happy Baby yogurts are perfectly sized for little tummies and there is NO sugar added! They also offer Happy Tot pouches that are great for my 4 and 5 year old boys (in the baby food section). Right now you can click here to snag a deal so you can try these for your kids! What are YOUR Fun Meal Time Tips?